We created the original Victorian Monogram collection almost 4 years ago and it has been our most well received collection ever! We decided to revisit the collection with Victorian Monogram 2. The collection uses the same colors and same type of flower, but everything else is different. If you have the original collection the first thing you will notice is that the letters are larger! Each letter comes in two different sizes, the small size is for the 5"x7" hoop and the larger letter is for jumbo hoops. The larger size of the letters allows you to fill a whole pillow with only one letter. The second aspect of the designs in this collection is instead of the flowers forming a square shape, they wrap around the letter for a more delicate look. 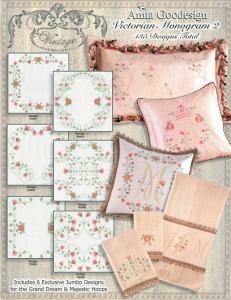 Like Victorian Monogram this collection comes with frames and border designs so that you can create endless arrangements. This collection has 6 additional jumbo designs for the Grand Dream and Majestic hoops.